Want your kids to have real fun in the pool? 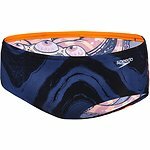 Our Flipturns collection is a bright approach to serious swimming, designed in vibrant prints to give kids positive experiences in the pool. Speedo Endurance+ fabric is twenty times more fade resistant than conventional elastane swimwear and offers freedom of movement. Great fit. Would definitely buy them again.